The Washington Post: “To chef Adán Medrano, author of the terrific ‘Truly Texas Mexican,’ Tex-Mex cooking has been an ever-evolving confluence of Mexican, European and indigenous Texas ingredients and techniques, the border between Mexico and America nonexistent to the people who developed this cuisine over centuries. 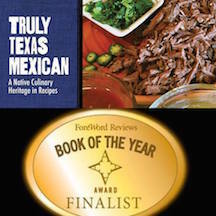 Midwest Book Review “Illustrated with full-color, full-page photography of its sumptuous dishes on virtually every other page, Truly Texas Mexican: A Native Culinary Heritage in Recipes is a wonderful treasury of 100 kitchen-tested recipes showcasing the heritage of Texas Mexican cuisine. From tasty Beef Tamales to Potato and Egg Tacos, Crab and Avocado Cocktail, Hibiscus Drink and much more, Truly Texas Mexican features flavors to remember. A superb addition to cookbook shelves! The Dallas Morning News “For the cook who’s also a history buff, Houston chef Adán Medrano’s Truly Texas Mexican: A Native Culinary Heritage in Recipes is a wonderful journey into the culinary history of the border region encompassing parts of Texas and Mexico before the border existed. The San Antonio Express-News ” ‘The flavor profile, the character of the food is like the land, straightforward, with no pretense,” he said. ‘The food says something about the character of Mexican-Americans. 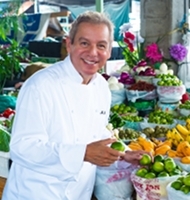 Chef and food writer Adán Medrano is a graduate of The Culinary Institute of America and holds an M.A. degree from the University of Texas, Austin. Now living in Houston, he grew up in San Antonio, Texas, and in northern Mexico, where he developed his expertise in the flavor profile and techniques of indigenous Texas Mexican food. Medrano’s professional experience includes fine dining venues such as “Restaurant Ten Bogaerde” in Koksijde, Belgium, cooking demonstrations in Amsterdam and showcasing his recipes at “Nao,” the CIA restaurant in San Antonio. Over thousands of years, Native Americans in what is now Texas passed down their ways of roasting, boiling, steaming, salting, drying, grinding, and blending. From one generation to another, these ancestors of Texas’s Mexican American community lent their culinary skills to combining native and foreign ingredients into the flavor profile of indigenous Texas Mexican cooking today. Building on what he learned from his own family, Adán Medrano captures this distinctive flavor profile in 100 kitchen-tested recipes, each with step-by-step instructions. Equally as careful with history, he details how hundreds of indigenous tribes in Texas gathered and hunted food, planted gardens, and cooked. Offering new culinary perspective on well-known dishes such as enchiladas and tamales, Medrano explains the complexities of aromatic chiles and how to develop flavor through technique as much as ingredients. Sharing freely the secrets of lesser-known culinary delights, such as turcos, a sweet pork pastry served as dessert, and posole, giant white corn treated with calcium hydroxide, he illuminates the mouth-watering interconnectedness of culture and cuisine. The recipes and personal anecdotes shared in Truly Texas Mexican illuminate the role that cuisine plays in identity and community. I am introducing you at the Bulverde Spring Branch Library Book and Author lunch on Sunday. Would you pleas send me a condensed bio that I may use? Additionally, will you answer the following: what is your favorite dish and what makes it so special to you?